"It's bittersweet," Michael Kelly said about the end of House of Cards. The final season of Netflix's political drama is finally here after many, many headlines, and at a one point an uncertain future. Netflix suspended production on the drama after it cut ties with Kevin Spacey following sexual misconduct allegations. Series star and executive producer Robin Wright lobbied to keep the show going in an effort to protect the 600 jobs associated with the production. "It was a lot to process and be thoughtful about, be very mindful of this incredibly crew and production that's been with us for six years, dedicated to the show," Wright told E! News' Carissa Culiner about the decision to continue the show. "And to close out the show the way we'd always intended to for the fans." As for that ending, Kelly and Wright said they're satisfied with the way the show wraps up. "We're always striving for that," Wright said. 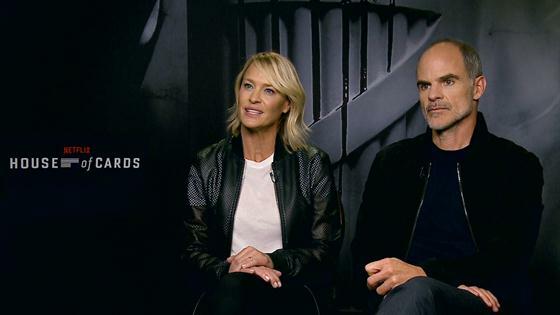 Wright and Kelly said they didn't have any input about how Spacey was written out, but they did work with the writers when it came down to the final interactions with their characters, Claire Underwood and Doug Stamper. Throughout the years, the characters have done some pretty awful things, including various murders. However, viewers have yet to see the worst thing Claire Underwood has done. That comes in the sixth and final season. "I think you've yet to see it," Wright teased. Wright's spent six seasons in the skin of Claire Underwood and said she still got a "beautiful surprise" this year. "It was decided very last minute, how merciful she can be," Wright teased. This season "shocks the hell out of you," Kelly said. "And it just makes you want to click to the next one. It's that appetite that you just can't quite fulfill." Click play on the video above to hear more from Wright and Kelly, including how the characters have changed them. House of Cards' final season is now streaming.